Just as the name denotes, the Prep Cooks are culinary professionals whose job is to prepare the food that is to be cooked. Duties included on the Prep Cook Resume include – preparing meat by slicing and cutting it in the appropriate size to be cooked, cleaning and maintaining the kitchen area, cleaning the vessels and glassware before and after cooking, managing the closing and opening duties, restocking items, labelling all items and organizing them, undertaking basic cooking tasks like parboiling food or reducing sauces; and performing all other duties as assigned. The Prep Cook should fulfill certain requirements such as – ample knowledge of health and safety rules of the kitchen, manual dexterity, ability to be patient and stand for long hours during the cooking process, very good physical condition and a good amount of endurance. Prep Cook doesn’t always need a formal education as a good amount of working experience with a postsecondary training is all that is needed for entry-level positions. 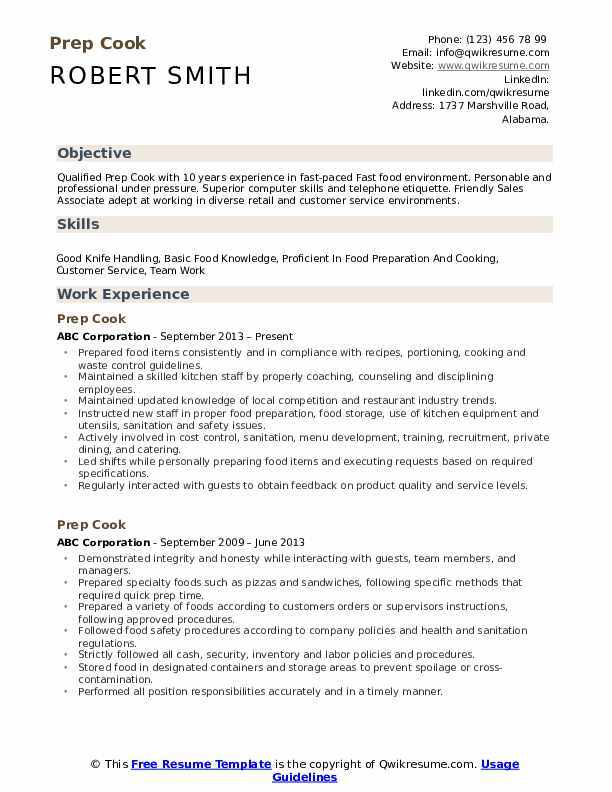 Summary : Qualified Prep Cook with 10 years experience in fast-paced Fast food environment. Personable and professional under pressure. Superior computer skills and telephone etiquette. 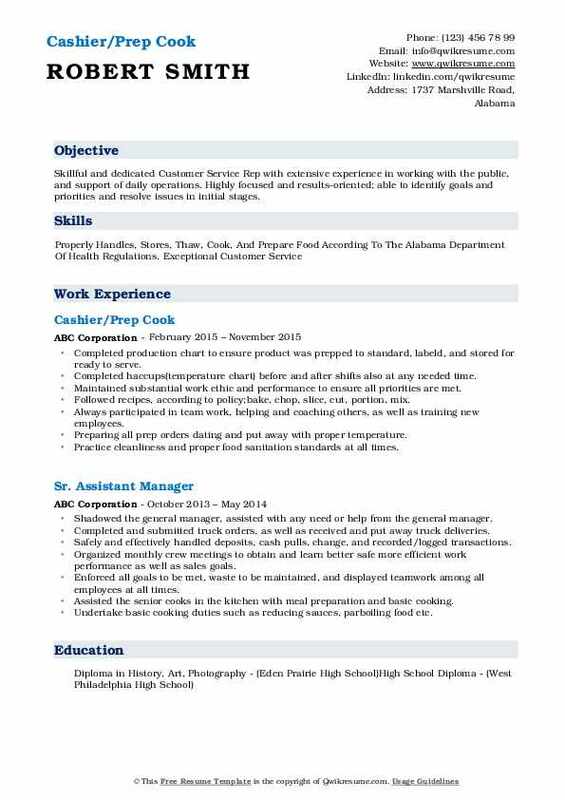 Friendly Sales Associate adept at working in diverse retail and customer service environments. Actively involved in cost control, sanitation, menu development, training, recruitment, private dining, and catering. Headline : Any position where my experience and interpersonal skills can be used to maximize kitchen/restaurant operations and customer satisfaction. I am an enthusiastic, detail-oriented Chef who excels in quick and efficient preparation of food items for grill, saute, oven, and other cooking stations. Assisted cooks and kitchen staff with various tasks as needed, and provided cooks with needed items. Informed supervisors when supplies were getting low and equipment was not working properly. Placed food trays over food warmers for immediate service, and stored them in refrigerated storage cabinets. Portioned and wrapped the food, and placed it directly on plates for service to patrons. Prepared a variety of foods according to customers orders and supervisor instructions, following approved procedures. Cut, sliced and ground meat, poultry, and seafood to prepare for cooking. Received and stored food supplies, equipment, and utensils in refrigerators, cupboards, and other storage areas. Objective : Qualified and motivated Customer Service Specialist with several years in fast-paced, team based customer service environments. Personable and professional under pressure, excelling at customer satisfaction and retention. 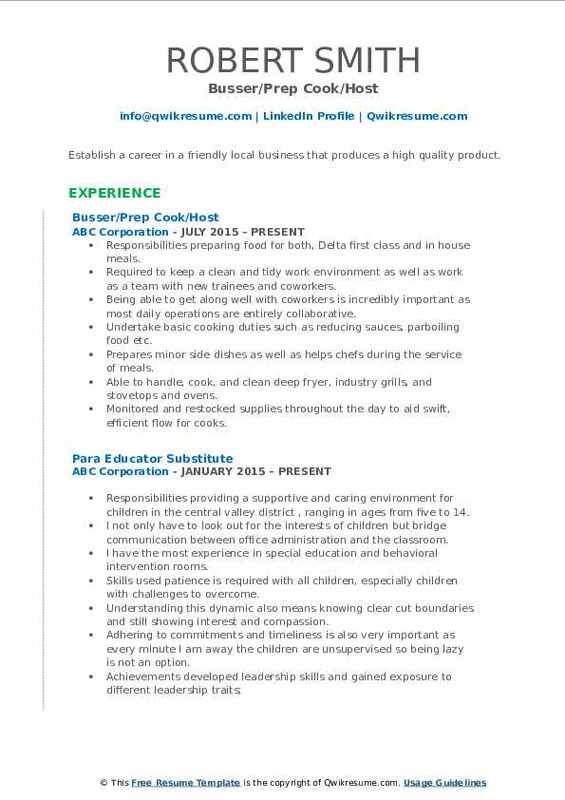 Skills : Time Management, Computer Proficiency, Multi-tasking Ability, Friendly Demeano,r Adaptability, Exceptional Communication, Good Telephone Etiquette, Strong Client Relations. Comprehensive knowledge of food and catering trends prepared food items consistently and in compliance with recipes, portioning, cooking, and waste control guidelines. Cooked and served food and meals in accordance with planned menus, diet plans, recipes, portions, temperature control procedures, and facility policies. Summary : Experience in fast-food work. Knowledge of: basic Microsoft Word, Word Perfect, basic Excel, basic CAD, basic data entry, 45 wpm, filing and organization skills, some invoicing skills, all knowledge of email programs, answering multi-line phones. Keeps the line cooks stocked with basic, critical items throughout the shift; and cleans, sanitizes, and maintains equipment, utensils, and tools. Developed organization and knife skills to reduce food prep time by 16 percent. Responsibilities plated, prepped, cooked the food and supervised my team. Clean, organize and maintain walk-in refrigerator, reach-in refrigerator, cooler drawers, prep, and dry storage area. 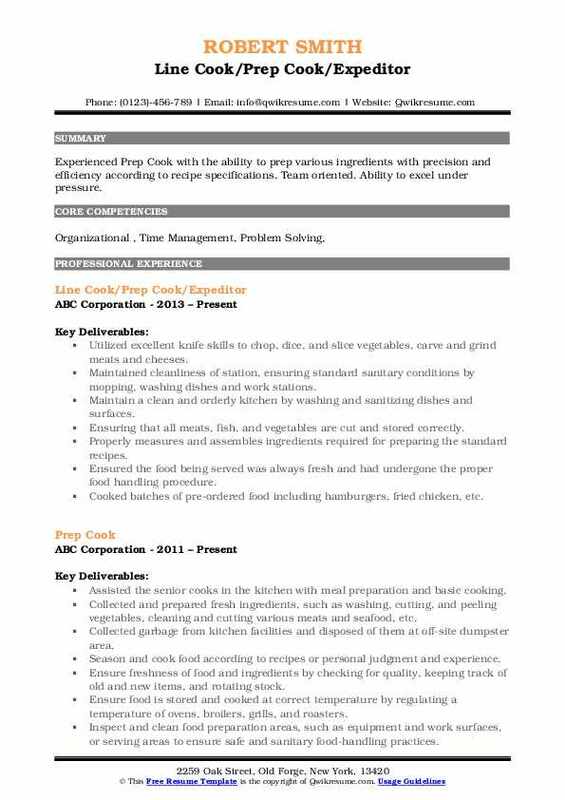 Worked as a prep cook, where I would prepare large amounts of food to serve to our guest. Objective : Trained and skilled in food service preparations with an exceptional proficiency in meal synchronization and service. 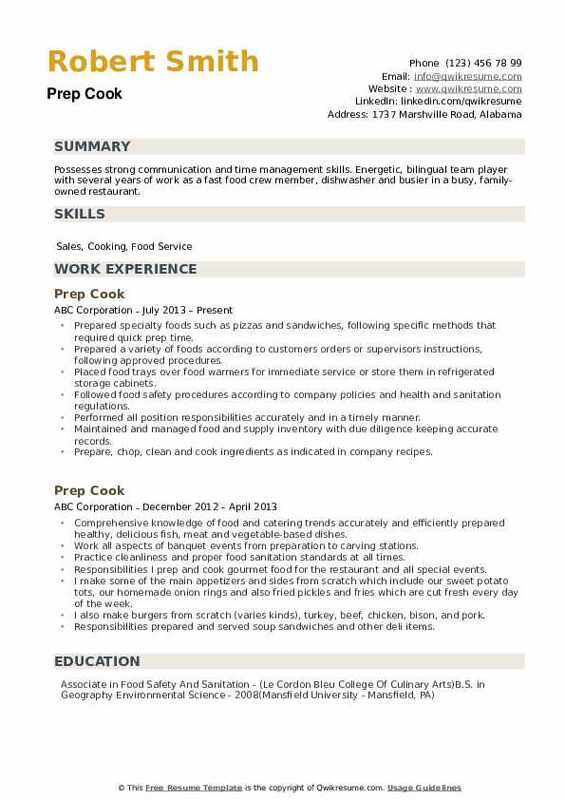 Seeking an entry level position into the food industry. Demonstrated ability in delivering high quality food service. Take and record the temperature of food and food storage areas such as refrigerators and freezers. Monitored freshness of food products helping to reduce spoilage by 11 percent. Ensures the highest quality food is prepared per the exact recipe specifications at all times. 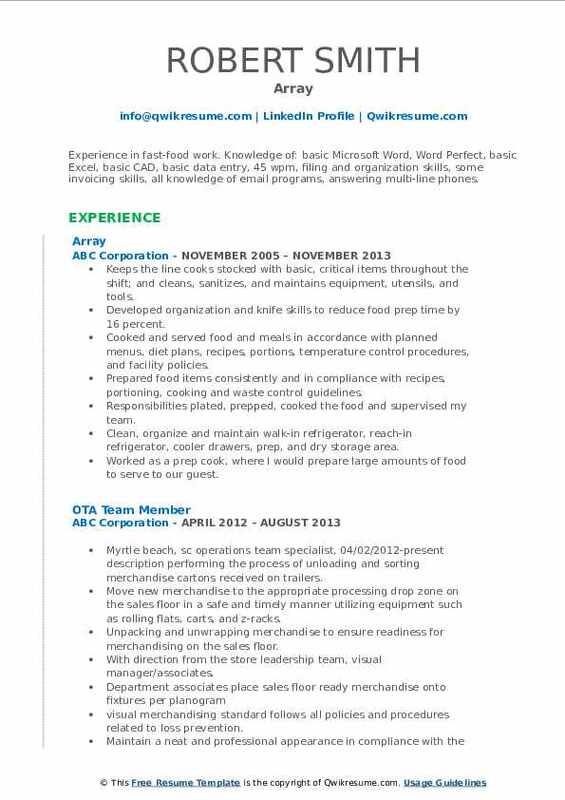 Objective : A Culinary Arts Enthusiast with four years of work experience. 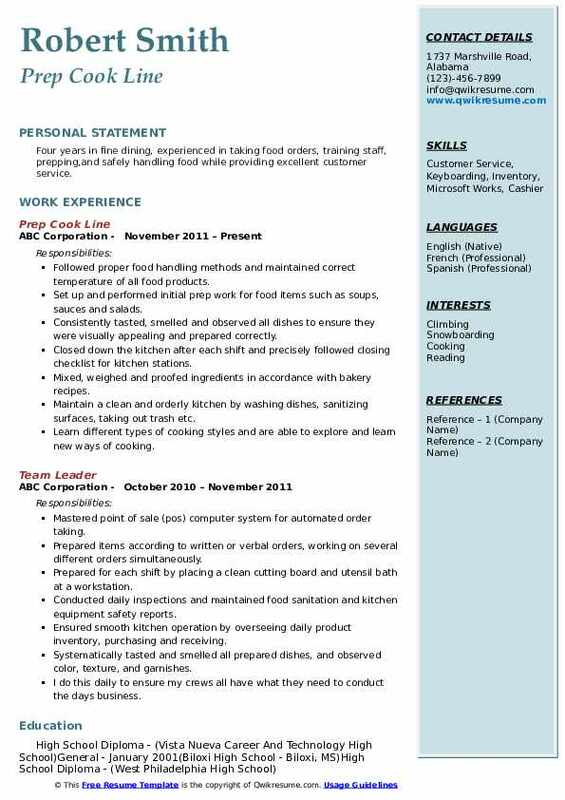 I want to acquire a position utilizing my food service skills, time management skills and quality assurance knowledge. Prepare all food items to order, following standard recipes and procedures within specified time limits. Kept kitchen hygiene to health department standards assisted guests with inquiries. Prepare and follow exact recipes, while conducting proper food safety and sanitation methods. Objective : I enjoy working with a team, I get along with everyone. I am flexible and adjust easily to change. I am an easy going person but a very hard worker, dedicated, loyal, and reliable. Duties included training all new hires, setting a good example for and retraining current employees, managing the kitchen, and handling internal problems throughout the restaurant. Maintained cleanliness of station ensuring sanitary conditions and scoring 95 percent on safety checks. Provided customers with great customer service while serving them products from our chef case as well as handling deli meats and cheese. Follow all recipes and procedures with no variation to ensure uncle pops popcorn is always providing the highest quality products. Undertake basic cooking duties such as reducing sauces, preparing entrees and salads. Headline : Cook with 5 years of experience cooking in fine dining environments. 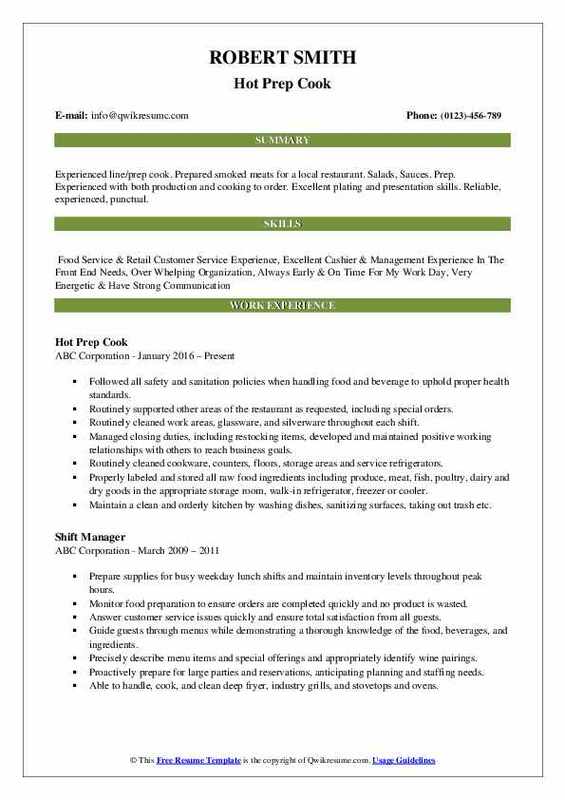 Prior work as prep cook, line chef, and sous chef. Practiced safe food handling procedures at all times accomplishments team leader. Summary : Interested in expanding my culinary arts with any food establishment or restaurant to eventually gain enough knowledge to operate my own business. Clean and sanitize all production equipment, surface areas for working and the whole of the kitchen areas as per the cleaning schedules and procedures. Wash dishes and pots, skillfully operate the dishwashing machine and allocate and keep clean utensils, dishes and pots. Adhere to proper food handling techniques and properly balance time use, material, and equipment to avoid unnecessary expense and waste. Strictly follow safety regulations, report unsafe conditions and all injuries and work practices to the supervisor. 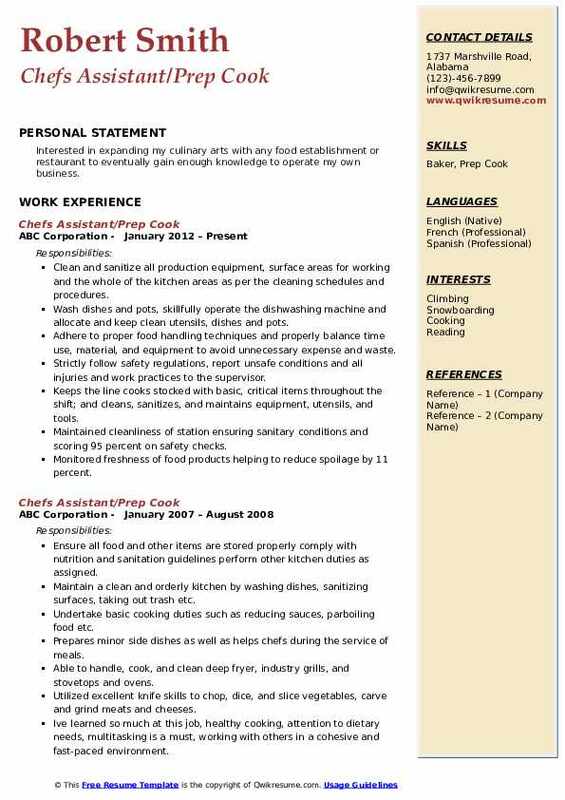 Headline : Possesses strong communication and time management skills. 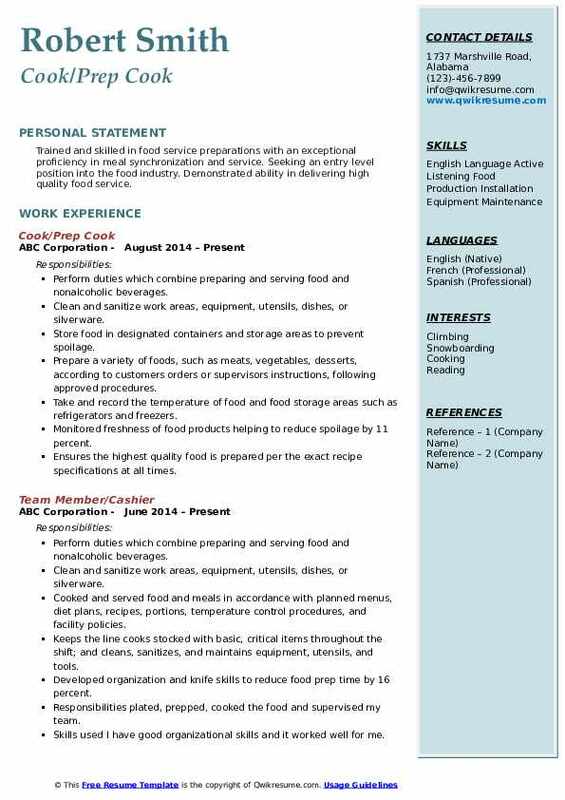 Energetic, bilingual team player with several years of work as a fast food crew member, dishwasher and busier in a busy, family-owned restaurant. Placed food trays over food warmers for immediate service or store them in refrigerated storage cabinets. Maintained and managed food and supply inventory with due diligence keeping accurate records. Prepare, chop, clean and cook ingredients as indicated in company recipes. 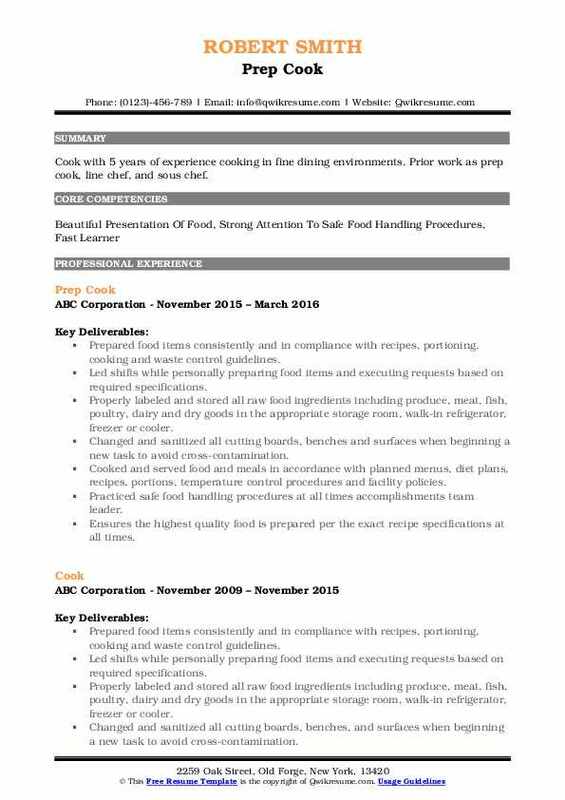 Summary : To obtain a position where I can maximize my professional culinary skills while bringing my multilayer of management, communication, organizational skills, and customer service. Changed and sanitized all cutting boards, benches, and surfaces when beginning a new task to avoid cross-contamination. Practiced safe food handling procedures at all times verified the freshness of products upon delivery. Ensure all food and other items are stored properly comply with nutrition and sanitation guidelines perform other kitchen duties as assigned. 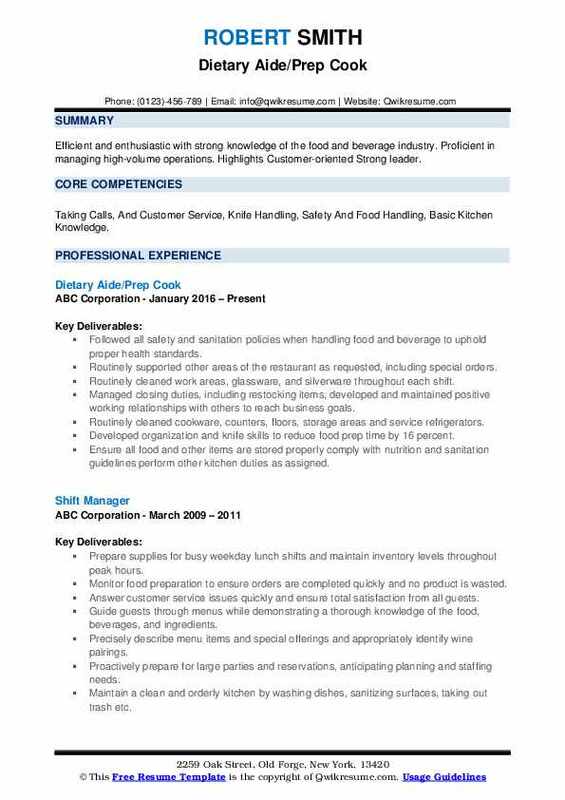 Summary : Efficient and enthusiastic with strong knowledge of the food and beverage industry. Proficient in managing high-volume operations. Highlights Customer-oriented Strong leader. 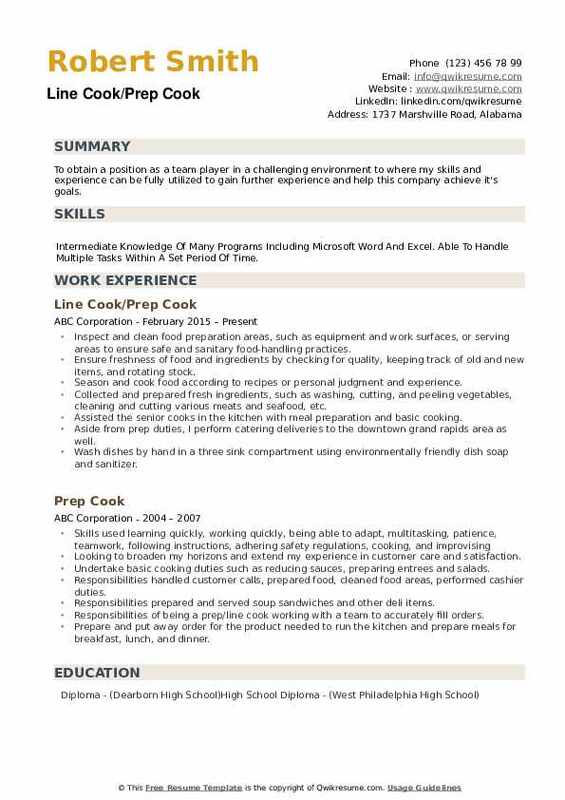 Skills : Taking Calls, And Customer Service, Knife Handling, Safety And Food Handling, Basic Kitchen Knowledge. Routinely supported other areas of the restaurant as requested, including special orders. Managed closing duties, including restocking items, developed and maintained positive working relationships with others to reach business goals. Routinely cleaned cookware, counters, floors, storage areas and service refrigerators. 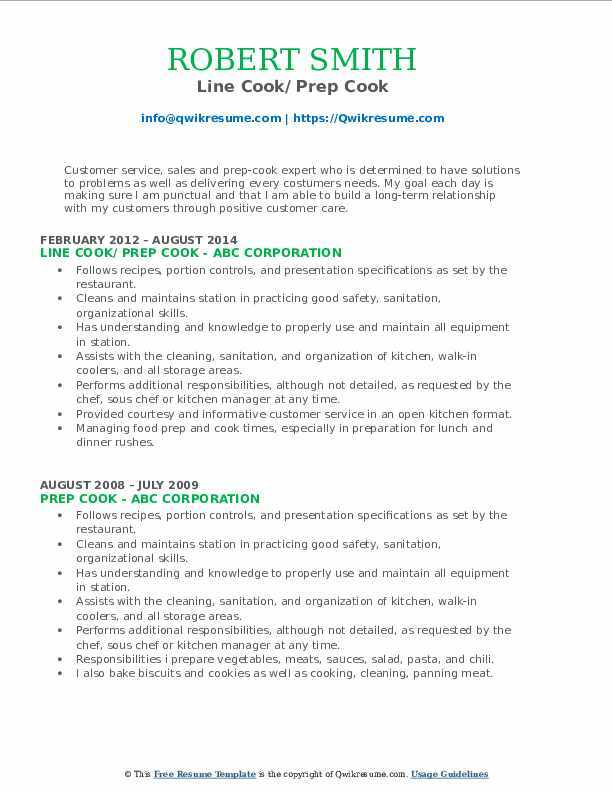 Summary : Experienced line/prep cook. Prepared smoked meats for a local restaurant. Salads, Sauces. Prep. Experienced with both production and cooking to order. Excellent plating and presentation skills. Reliable, experienced, punctual. Objective : Establish a career in a friendly local business that produces a high quality product. Responsibilities preparing food for both, Delta first class and in house meals. 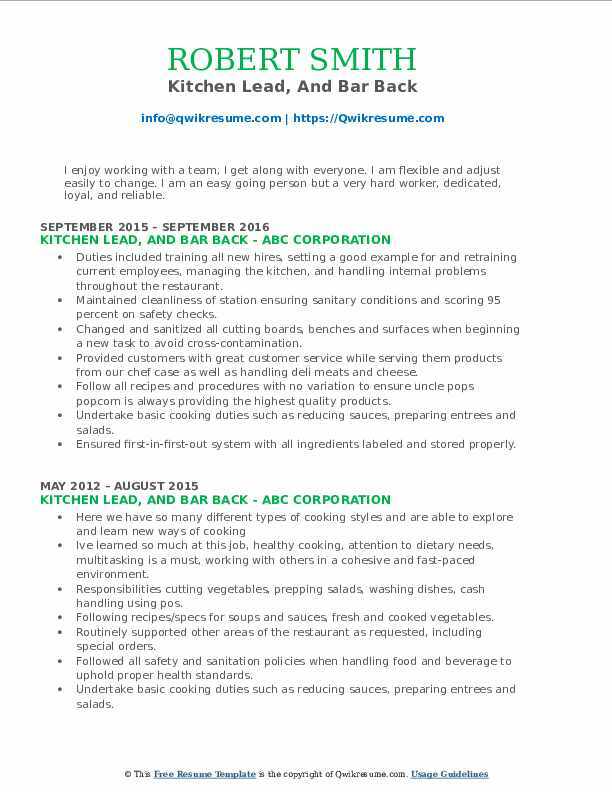 Required to keep a clean and tidy work environment as well as work as a team with new trainees and coworkers. Being able to get along well with coworkers is incredibly important as most daily operations are entirely collaborative. Prepares minor side dishes as well as helps chefs during the service of meals. Able to handle, cook, and clean deep fryer, industry grills, and stovetops and ovens. Monitored and restocked supplies throughout the day to aid swift, efficient flow for cooks. 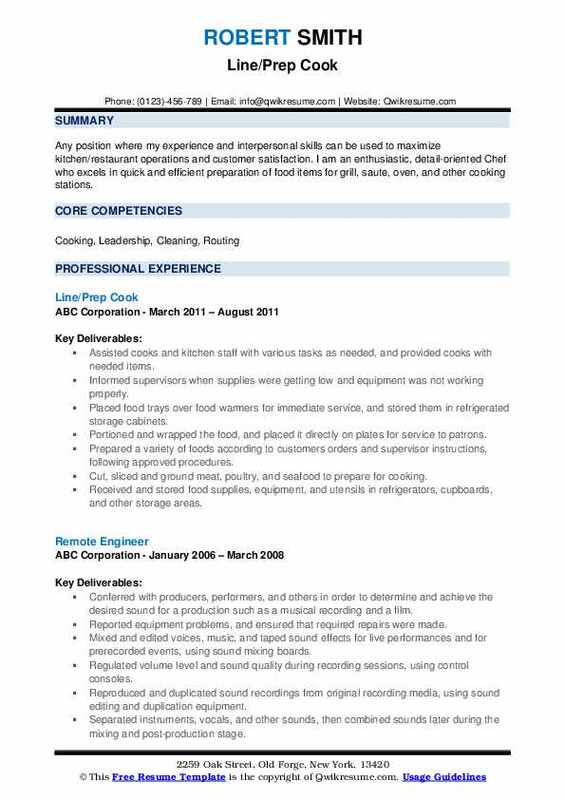 Summary : Four years in fine dining, experienced in taking food orders, training staff, prepping,and safely handling food while providing excellent customer service. Consistently tasted, smelled and observed all dishes to ensure they were visually appealing and prepared correctly. Mixed, weighed and proofed ingredients in accordance with bakery recipes. Learn different types of cooking styles and are able to explore and learn new ways of cooking. 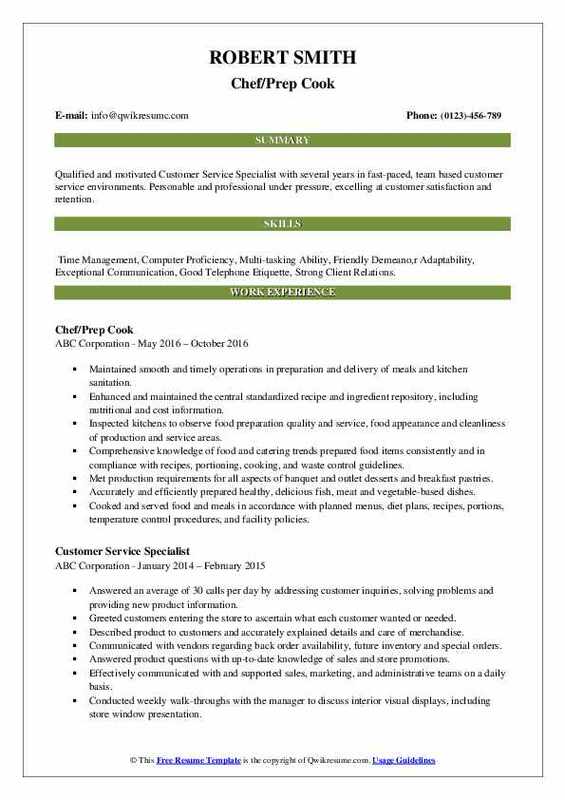 Objective : Skillful and dedicated Customer Service Rep with extensive experience in working with the public, and support of daily operations. Highly focused and results-oriented; able to identify goals and priorities and resolve issues in initial stages. Completed production chart to ensure product was prepped to standard, labeld, and stored for ready to serve. Completed haccups(temperature chart) before and after shifts also at any needed time. 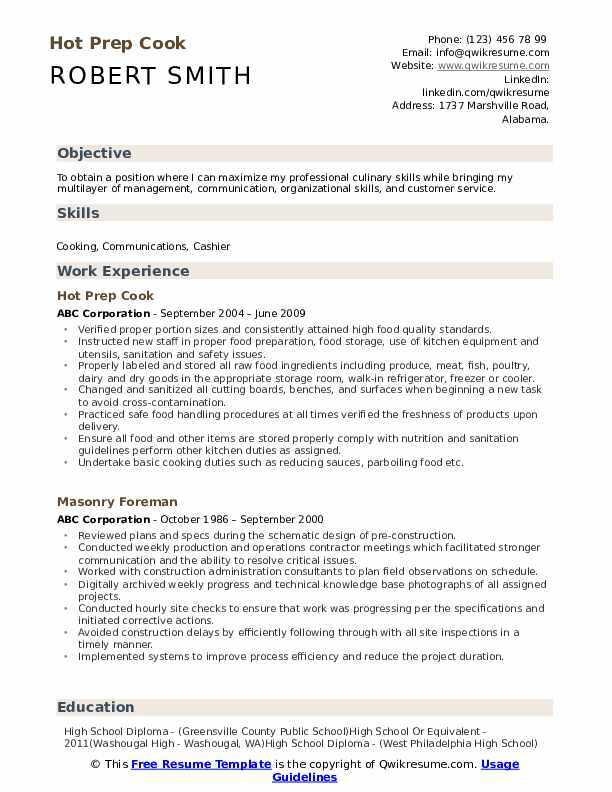 Maintained substantial work ethic and performance to ensure all priorities are met. Followed recipes, according to policy;bake, chop, slice, cut, portion, mix. Always participated in team work, helping and coaching others, as well as training new employees. Preparing all prep orders dating and put away with proper temperature. Practice cleanliness and proper food sanitation standards at all times. Headline : Customer service, sales and prep-cook expert who is determined to have solutions to problems as well as delivering every costumers needs. My goal each day is making sure I am punctual and that I am able to build a long-term relationship with my customers through positive customer care. Performs additional responsibilities, although not detailed, as requested by the chef, sous chef or kitchen manager at any time. Provided courtesy and informative customer service in an open kitchen format. Managing food prep and cook times, especially in preparation for lunch and dinner rushes. Summary : Experienced Prep Cook with the ability to prep various ingredients with precision and efficiency according to recipe specifications. Team oriented. Ability to excel under pressure. Utilized excellent knife skills to chop, dice, and slice vegetables, carve and grind meats and cheeses. Maintained cleanliness of station, ensuring standard sanitary conditions by mopping, washing dishes and work stations. Maintain a clean and orderly kitchen by washing and sanitizing dishes and surfaces. Ensuring that all meats, fish, and vegetables are cut and stored correctly. Ensured the food being served was always fresh and had undergone the proper food handling procedure. Cooked batches of pre-ordered food including hamburgers, fried chicken, etc. Objective : I am good at most anything I do. I am a very fast learner and I am interested in computers and I am a friendly person. Use many skills such as slicing and dicing, cooking and cleaning. Followed proper food handling methods and maintained the correct temperature of all food products. Open kitchen, plan and prepare meals for a hot table in MSP airport. Ability to work under pressure and to complete my meals by the deadline. Use and care of all kitchen equipment including coolers, freezers, dishwashers, gas-ranges, convection ovens, deli-slicers, and other basic equipment. 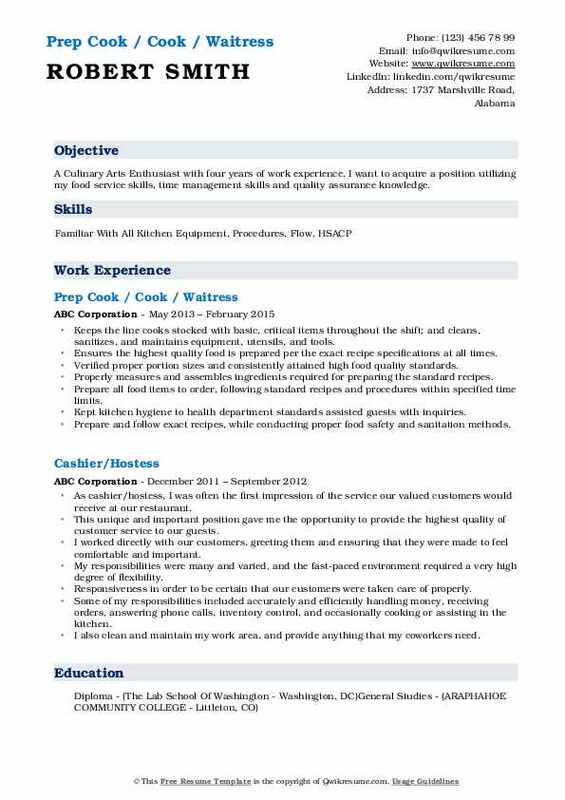 Summary : To obtain a position as a team player in a challenging environment to where my skills and experience can be fully utilized to gain further experience and help this company achieve it's goals. 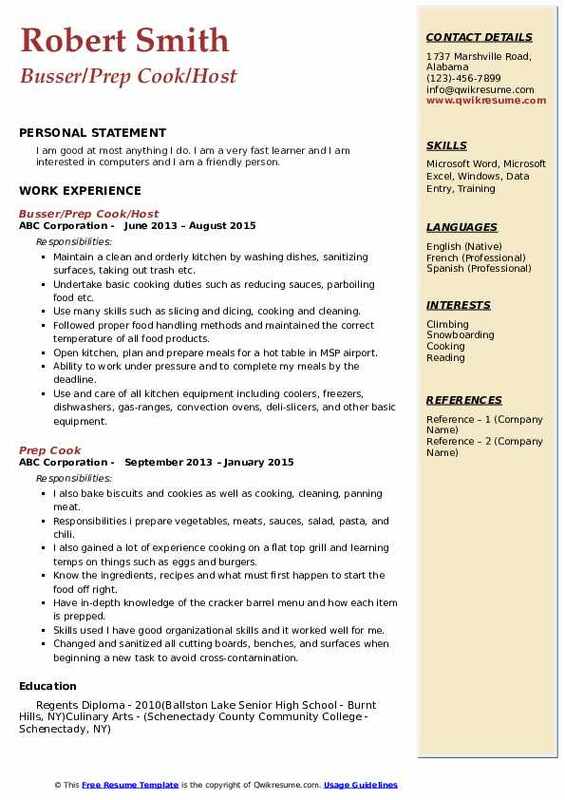 Skills : Intermediate Knowledge Of Many Programs Including Microsoft Word And Excel. Able To Handle Multiple Tasks Within A Set Period Of Time. Collected and prepared fresh ingredients, such as washing, cutting, and peeling vegetables, cleaning and cutting various meats and seafood, etc. Assisted the senior cooks in the kitchen with meal preparation and basic cooking. Aside from prep duties, I perform catering deliveries to the downtown grand rapids area as well. Wash dishes by hand in a three sink compartment using environmentally friendly dish soap and sanitizer.